February is always the most humid month in Sydney; days and nights enervate. I think of those who suffer with depression and wonder if these humid nights are a greater burden. I am so thankful for my ceiling fan. As I said last time, my sense of loss is no longer as painful; grief has modulated into a very specific loneliness for which no company or friendship can quite provide adequate balm. Having said that, the proposition of nights alone is often daunting and much easier in the company of loved ones. In looking back over my notes on this journey, I spent a bit of time looking at the “Stages of Grief” as outlined by Elizabeth Kübler-Ross in her book, On Death and Dying. I thought it would be pertinent to see how much of my last seven months has mirrored this framework. It should be said that these are not strict, chronological stages; some may be revisited, for example, Stage 4, which is depression. Stage 1 – Denial: The shock of losing a loved one usually hurls us into denial, a state that helps us to survive the loss. It is not so much a denial of what has happened as numbness to the impact of what has happened. In Kübler-Ross’ words, “There is a grace in denial.” That grace allows us to regulate – pace – our feelings of grief; we simply walk, or stumble, through the basic commitments of each day: getting up, showering, having breakfast, etc. This disconnection, if handled properly, will see us gradually begin to ask questions in order to begin the healing process. For me this process was very real. I could not really write or do much else other than go through the motions, where numbness ruled, apart from the occasional electric jolt when a thought or association would shock into life the monster of grief. I can’t recall being angry. Although I had anticipated Ngaire’s death for many years, hope had arisen in the form of a lung-transplant. When she died, possibly within days of lungs becoming available, the sudden shift from hope to hope shattered was staggering in its finality, like a guillotine-blade through the soul. I had, of course, considered that Ngaire might die; we had to face that very real possibility, as part of the process in preparation for a transplant, not to mention that for her to have a terminal condition was a perpetual reminder of her potentially imminent mortality. I actually felt that, if she died, I would be angry at God for callously allowing us to hope, only to rob us at the final hurdle (especially after so many hurdles that dear Ngaire had already jumped). However, I wasn’t angry; instead, in the midst of the pain I felt a great peace and an abiding understanding that God is good. I actually don’t get that. Immediately I hear my own voice saying that this is just another form of denial. Maybe. It could be that this whole process of the last seven months has just been a little padded cell in which I have put myself, protecting that self from hard truth – an extension of denial that is shaded and coloured by the need to fool myself that God is in control and that I am engaging truly in grief and loss; or maybe there is another reality. Maybe God is good and there is an eternal perspective that exists well outside the confines of my egocentricity, a perspective in which the oneness of creation is paramount and is not particularly ruffled by my need to have answers. I have no other explanation for why I mostly have this peace. Stage 3 – Bargaining: I think this is more an issue for the one who him/herself has been given a death sentence. The individual bargains with the Higher Being for an extension in years, in exchange for a reformed lifestyle, or some such. I do remember in passing, a comment that I made to Ngaire, after she went, that I would give everything I had to hold her and kiss her and laugh with her one more time. He needed to understand, as do we all, that we have value in the lives of others. One of the most significant things that have given me the impetus to work through this whole painful process is that I know that I have almost immeasurable value in the lives of my boys. I have referred in my blogs to the dark places that I have visited over the last year; it has only been in the last month or so that the frequency of these visits has diminished. Nonetheless, it sometimes doesn’t take much. Just a couple of weeks ago, as I was going to sleep, my mind went to one of the few times that Ngaire cried in fear that she might die; I remembered her saying through her tears, “I don’t want to die….”. I hadn’t even thought of that before, but instantly the rug was pulled out from under my soul, and depression and sleeplessness was my lot for the rest of the night. According to Kübler-Ross, depression could be referred to as the dress rehearsal for the “aftermath”; feeling sadness, regret, fear and uncertainty is natural at this stage. These emotions show a beginning of acceptance of the situation. Stage 5 – Acceptance: I guess this is pretty much where I am now. It’s the understanding and attitude of heart that there is a future, and that everything is going to be OK. It is simply what it says: acceptance of the situation. Now a number of my friends are facing very solid journeys themselves. One thing that these Stages of Grief don’t account for is that, for those of us who recognise a connection with God, there is always an underlying hope, no matter how hidden it may seem at times. God’s way is the way of love. His way may include healing; I know more than one person who has been miraculously healed of deadly types of cancer. But, to hark back to a couple of blogs ago, the love of God, in which we trust, is transcendent; that is why we have an underlying hope, because it is not only good for this life but also beyond. “Neither death, nor life…the present nor the future…nor anything else in all creation can separate us from the love of God…”* and love means hope. For those who have only started reading this blog or are reasonably new to it, I am documenting the journey of grief, so if it seems self-indulgent, forgive me; there is method in the madness, in the hope that some may find it helpful. It’s been a couple of weeks since I last wrote and, to be honest, I have felt a little exhausted and daunted at the thought of looking at another aspect of this journey. I thought that there may be time to pause and go through the motions of getting used to routine in this new, unfamiliarly-shaped life. No such luck, I’m afraid. The question began to swell in me as I looked into the chamber within that held what I was feeling. I opened the door that day-to-day life had kept reasonably hidden and was suddenly flooded with the realisation that I was incredibly lonely, in fact, it dawned on me that I was never more lonely. I didn’t cry, but the sudden awareness had tears quietly trickling down my face. Although I recognised that I had been feeling this way for some time, it was still a shock to be confronted by it. I spend time with people every day – friends, family – all of whom are kind, loving, even affectionate in their love. We often speak frankly and share things of our hearts, and yet there seem to be foundational elements of who I am deep inside, that seem to have had their life in communion with Ngaire and only with her. You could probably think that this is just a convoluted way of saying that I really miss her. Of course I do, but this isn’t the same. In truth, I think I am managing the “missing” reasonably well. As I have mentioned in previous blogs, the pain of losing her is no longer sharp, and I am far more at peace in that regard. No, this is more about the loss of companionship, the communion that was potent and real, even without words. It is the fellowship of spirit that doesn’t exist with another, no matter how much I love them, or they me; the closeness is never matched; the companionship is not soul-to-soul. Perhaps this is part of the vulnerability of those who have lost a spouse; some quickly hook up with another, presumably to try and reconnect those nerves of the soul that are exposed and unprotected. Maybe it is for other reasons completely and I am just waxing lyrical. I suspect not. The blazing empyrean of the night. To wake with me again. You will have read that we were just in California for Christmas. Eighteen months ago, Ngaire and I visited Bethel Church in Redding, Northern California. For Ngaire, it was her third visit. Many thousands of people have experienced healing through visiting this place; of this I have no doubt. Ngaire herself, as I have mentioned before, after her first visit to Bethel, went from being highly symptomatic to symptom-free for the eighteen months following. However, after the two subsequent visits, there was no difference. In fact, it was after our last visit that she began to require oxygen therapy twenty-four hours a day. So why wasn’t she healed? I don’t know. That’s not what I’m writing about today. I will share some thoughts in the future, though. As the trip was a kind of pilgrimage, it was, almost entirely, contemplative; we read much, talked much, absorbed much, stepped across the “physical divide” much and listened to music, some of which we had just bought. There was a palpable sense of otherworld-ness as we left the town, escorted down the long driveway of Bethel Church by a bald eagle floating parallel to our car. The new music that we had playing filled us with a sense of hope and seemed to confirm our feelings that healing was imminent. Yesterday I played that same music for the first time. Instead of melancholy, it again filled me with a sense of hope. Part of me thought that that was quite bizarre. After all, didn’t that hope disappoint? Not only was Ngaire not healed, but she became rapidly worse and continued so until she died, twelve months later. I think that like many of us, I have had a belief that hope is what you do, so that when something happens to us that is contrary to what we had hoped, our hope is therefore diminished, not to be trusted, or even destroyed. Ngaire died, despite our best hopes; but I think I’m starting to see that our hopes are not Hope. What if Hope has a life, strength and potency all of its own? What if Hope is something on which we draw, rather than something we whip up or project onto our future as a kind of semblance of our faith? A few blogs back I spoke of some of the things that I have learnt about faith. One of them is that faith is not about having an expected outcome. While we were away over the Christmas period, I heard a young man say that there is no such thing as an unanswered prayer. His statement got me thinking again about how we have made so much of what we believe into a set of mantras so that we can put God into a manageable framework that helps us to keep things under control and to bring us, hopefully, an expected outcome. If we don’t do that, then God dwells, at least partly, in the unknown and mysterious; this doesn’t work for us. So our theology becomes a series of “therefores” e.g. God wants to give me good things, and he is a loving father, therefore there is no such thing as unanswered prayer, because he’s just busting to bless me – a little simplistic perhaps, but the problem with so much of what I have learnt is that it is part of this derivative system of belief: the great therefore. The real issue here is that, depending on what form of logic you use, you can make virtually anything mean what you want it to mean, rather than necessarily what it is saying; just read Plato. But I digress…..kind of…because I was talking about hope. He might as well have said, “When everything you believe is boiled down, this is what you’re left with: Faith, Hope and Love.” And it seems that Love is what makes sense of it all. When I have thought of love, it has usually been associated in my mind and heart with a feeling, something that comes from within, establishing and/or confirming an emotional relationship with another person. But what if those feelings are simply the “exhaust” of a far greater engine? Of course, this is not a new thought with regard to love; greats have shared their wisdom for thousands of years, and the great commonality is that love – real love – is entirely selfless. It is not about what I get; it is about what I willingly lose for the sake of another. In a marriage or life partnership, the beauty in that mutual sacrifice is the gateway to oneness. Love then, is a way, not a feeling. So, as I ponder Hope and how it still makes its presence felt in my life after being so disappointed, it really doesn’t make sense unless seen in the context of the way of love. Maybe people could say that I’m trying to find reasons why my beloved Ngaire died thirty or forty years before her time. It is no longer good enough for me to believe a self-serving theology of heaven and prosperity – which, one would think, includes the ongoing presence and love of my life partner – no matter how worthy, if God is not on the same page. I guess this means that I’m discovering the transcendence of hope, because the way of love is transcendent, and that is what makes sense of hope; it is not only superior, but outside of space and time, with a strength and nature of its own that is not dictated by the whims of our desires, no matter how strongly we feel, no matter how painful the path. So, now we are back home and life has resumed as normal. North-American Christmas has given way to the beautiful post-Christmas summer of Sydney: fresh, seasonal avocadoes, mangos and watermelon, along with the smell of gardenias, the ubiquitous barbecue, cold drinks and sun on skin. Although we bathed in the peace of our time away, there is a great sense of home and rest in Sydney at this time of year; everyone is in a relaxed mood, the air is warm, the traffic light, and it’s all about relaxing and spending time with friends, for as long as we can make it last. I love this time of year here. Being back has had me reflecting, in a peaceful way, on the journey of the past nearly-six months; I have written about grief and all of its facets – at least, what I have been able to identify within the context of the relationship that Ngaire, our boys and I shared; I have had marvelous conversations with friends and family – life-filled conversations – that have gone deep and helped bring a measure of peace and understanding; I have sat to write many times, having experienced an aspect of pain or loss, and in the engaging, found profound, unexpected truth. Though I don’t anticipate that this journey will ever fully end, I have found myself in a different headspace lately; some of the things of which I have been apprehensive have taken on elements of peace, and become building-blocks for the future: unexpected but deeply appreciated. Today is Ngaire’s birthday. Birthdays in our family would normally be mini festivals that stretch over at least a few days; this was something that Ngaire instituted and perfected – an honouring of a person that would leave them in no doubt that they were loved. This practical and caring demonstration of my love is what I am unable to give today; but this now leaves me with melancholy more than pain. Now, most of the time, when I think about Ngaire, I see her smiling, vibrant and full of life. I don’t know how or when that happened, but I am glad for it, and in many ways, feel that it happened in spite of me. This brings me to what I have really been thinking about. It would seem pretty obvious that grief is a process that the bereaved person goes through and, no matter how well supported they are, is quite a solitary journey. It occurred to me recently however, that Ngaire has been my almost-constant companion through this process. I am coming to understand that how I thought of her through this process is an indication of what I was going through. For example, throughout much of this period, my mind has gone over and over her last weeks, particularly her last day. The pathos of her frailty and weakness has at times been overwhelming in my mind. It has screamed at my ineptitude at not being able to save her and laid bare the inadequacy of my support, provision and care for her, all of which laid an axe to the root of my perception of who I was, as a man and husband. Over time and particularly through our “time of peace” away over Christmas, I have been able to let go of many of these feelings. I know that there was nothing that I could have done, and now my heart is beginning to agree with my head. Now, I think far less of the tragic moments before her death and more of the happy, healthy, vibrant girl that Ngaire was for most of our life together. I get the sentiment, but it seems to me that it would require a “short-circuiting” of the whole process of grief. One thing that I have been discovering on this journey is that the engagement is everything. Pain can be a good thing if we, with our limited, pain-minimising Western understanding, can clasp hands with our inner life and walk through the pain. It’s the old in and through. I know there are different kinds of loss; I can’t imagine – or perhaps I can – of losing a child or another close loved one through sudden, tragic circumstances; I couldn’t begin to fathom the pain of those who lose many members of their family in a car accident, and find themselves alone in their anguish. This I do now know: grief is the path to healing; if I do not engage in the pain and walk through it, I will become misshapen by it. I also believe that a key is the need for me to continue to give as well as receive love; in the giving, the flow of life is restored, little by little. Ngaire is still my companion, but now there is peace and, dare I say, even a modicum of joy for who she was. I still miss her, every day, but now I see her smiling. She was also a twin, so today is her beloved sister’s birthday too. Everyone has their journey, so we need to tread gently. It’s been a few weeks since I last wrote in here. I’ve been very busy, but have still managed to jot something in a journal. I’ll bring you up-to-date that way. Everyone whom I tell about why we are going to California for Christmas says that it’s a great idea, but I need to address an issue. I have I think, embraced many aspects of grief in this journey of approaching Ngaire’s death, then living beyond it; but some things I have not embraced: going through her things, for instance, will require a distance that hasn’t formed yet. I don’t mean a distance in terms of being detached, but a distance that, through time and the processing of pain, creates a space in which much of the difficult and confronting has lost its sting. This journey overseas then, while presenting itself as restful and new is, in many ways, running from the pain that would be, should we have endeavoured to have Christmas at home, without the one who did Christmas so well, who made even the smallest of gifts special, who gave of herself in thought, passion and detail to create “special”. So, I think my plan to go away, though ostensibly considerate of our family’s pain, probably had its genesis in a good element of not wanting to face Christmas at home. By the way, it is now Friday and will be for quite some time. I am on the plane with Eddy. It is 7.00 p.m. Sydney time, but 12.00 a.m. San Francisco time. As an aside, going through security was a new experience. I had taken everything out of my pockets, but the metal-detector was still set off. I took off my shoes and belt, still to no avail. Only when I remembered that this was my first flight since having a hip replacement (metal) last March, did it click. One body scan later and I was passed as a non-terrorist. Back to our “escape”: Although I am an adult, able and generally responsible in my own life, I understand that there are those who, for whatever reason, can’t escape this Christmas. Last weekend, Ngaire’s birth family, partners and children, got together for our annual Christmas “do”. We often have it well before Christmas as so many need to be in other places on Christmas Day. In this, none of us could escape, for even though there were gifts, wonderful food, drinks and laughter, there was a conspicuous vacancy in all of our hearts, which paradoxically took on a kind of form in our gathering, as we spoke in small groups of our loss and grief, of how the hole left by our our precious sister, wife, friend, mentor, loving aunt, mumma, is a chasm confronted daily. It was, in the words of one email that circulated the next day, “weird and disjointed”. Perhaps we were together observing the journey of our beloved who has stepped out of time; and we realised that we cannot touch her, hold her, laugh with her or even cry with her, anymore. Although we tried to make it as normal as it has always been, this was an event in which Ngaire always played a large part. Indeed, her “largesse” was a great part of what was missing. In our little branch of the family, we are creating, in our escape, a different shape, a Christmas that she has not inhabited before, physically, but one in which she will be present in our thoughts and shared love. On this trip, we will visit places in Northern California that I have only ever seen before with her, many only last year. One of our favourite places on Earth is Yosemite National Park, wherein lies a beautiful old stone lodge – now a magnificent hotel. Ngaire and I had agreed that one day we would have Christmas dinner there. That is where the boys and I will be on Christmas Day. So this escape is, in some ways, more of an engagement, for me anyway, because I will be celebrating, confronting and building from that which we shared; and I will be underlining the hope. I have no expectations other than that we will engage. So now, I sit (real time, not transcribing journal entries) having encountered some of those places where Ngaire and I spent time, from cafés to mountains and, I have to say, while at times there have been powerful and poignant emotions, in general, there has been a large degree of peace. This town, Redding, was part of our last pilgrimage together, in search of restored health for her, so the memories are bittersweet. More important to me are the places where we spent time, in enjoyment, conversation and laughter. I have spent time in some, felt it enough to just view others, but the surprising thing to me in this engagement is the great sense of peace. There haven’t been any tears yet – some melancholy, for sure – but the overall experience has been of life: My son, his friends and their journeys that are just beginning with love and fresh pages; the friends, with whom we are staying whose generosity and warmth is both humbling and joyous; the wonder and beauty of creation that gives pause when self-importance rears its arrogant and unhelpful head. As I recall this, now I have tears….and peace. I’ll let you know how Christmas goes. 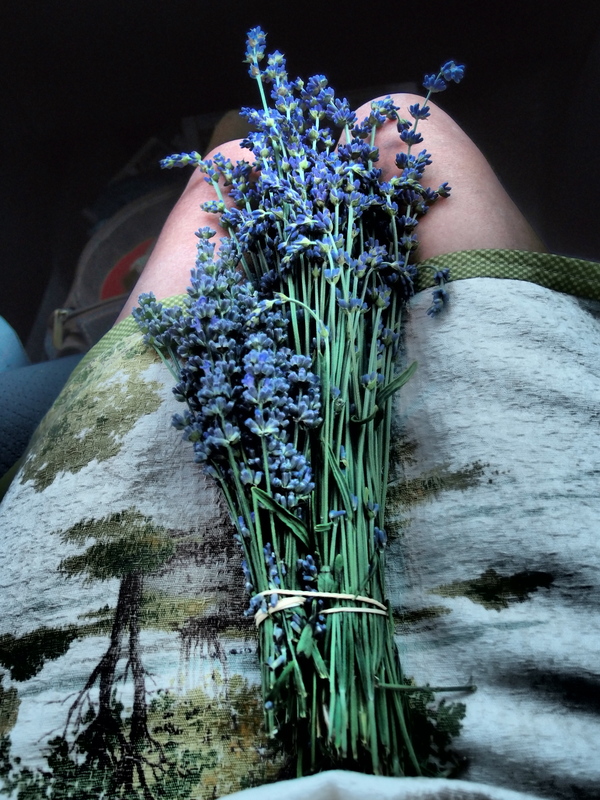 Last year, the owner of a lavender farm, just north of Mt Shasta, gave Ngaire a bunch. She took this picture of it on her lap. There is the supposition that we (read “I”) have in life, that if things have taken a bad turn, they will gradually improve. That has been my expectation, though those of you who have been reading this blog over the last six months or more would know that there have been plenty of hiatuses along the way. I have spoken to lots of Ngaire’s friends who are still struggling – finding themselves in tears at the strangest times and for unexpected reasons. There doesn’t seem to be any rhyme or reason to it. Yesterday I had a break around lunchtime and thought that I would grab a few things for Christmas, for the younger kids in our extended family. After taking twenty minutes to find a parking spot at the mall, I began the procession of arcades and moving footways as a great sadness enveloped me. I used to do this very thing with Ngaire. She loved it – lived for it – buying exactly the right thing for each person. Cheap junk was never good enough. She always valued each little life and it would be evident in the gifts that she chose. By the time I got to the shop, the world around me was blurry from welling tears and it was an effort to stop my bottom lip from quivering. I took a decision to can that idea and go to the department store to buy something for me. I needed a new shirt for work, so thought I’d take the opportunity as a diversion. After looking at a couple of shirts that I liked, I gradually became inundated, like water rising around my feet, and I felt hopelessly insecure that she might not like my choice (even though she would always say that she didn’t care, as long as I liked it). I stood in the men’s department, looking around, but seeing nothing. I turned and made my way back to the car. These reminders don’t come at an intellectual level; they are visceral. They penetrate unobserved and bring all those hidden emotions to life, along with all their connections: joy, pleasure, love, sadness, loss, hope. Ah…hope. That’s a tough one, but I’ll come back to it later. Since Ngaire died, we have had a few milestones: Our son Remy’s birthday, Fathers’ Day, then, more recently, our wedding anniversary and, just this week, my birthday. A friend told me that the hardest part of grieving takes a year, because all of those milestones have to be encountered for the first time without her. So far, our wedding anniversary was the hardest and that was unexpected; we didn’t normally give a lot of attention to anniversaries unless they were of a significant number. All through the day when I wasn’t concentrating on work or something else, my mind drifted to that beautiful, young girl making vows and giving her life and love to me. I had numerous “moments”. It occurs to me that, regardless of our philosophical or religious viewpoint, all of our celebrations pivot around a core element of hope. In a birthday, we celebrate a person’s life and hope for the year ahead; at Christmas we allow ourselves to unearth in our hearts the mysterious hope that Peace on Earth might one day be. What is the phrase “Happy New Year” all about, if not loaded with hope? Every celebration seems to be at once a reflection on the past with hope for the future. Surely this is why they are so difficult in the grieving process. In death, the past is all there is. Hope has been disappointed – catastrophically – and needs to be refashioned so as not to include the one towards whom so much of your hope was directed. I am apprehensive at the thought of New Year’s celebrations. It will be an embarkation on a year in which Ngaire will have never existed on this Earth, and I’m not quite sure how that will go. Yet, in the refashioning, love has a way of making itself central. For my birthday, I received a note from my youngest son, Eddy. While acknowledging how tough this year has been and how incredulous he still is that Ngaire has gone, in his pain he fashioned hope for us both. I know that all of my boys are gradually doing that, it’s just that Eddy was the first one to put it so beautifully and powerfully: love, encouragement, loyalty and hope. It touched something very deep in me that was neither grief nor loss, and fanned the weak ember of hope within. I feel like I’m a bit of an expert on hope. It has been one of the hallmarks of our life together. Ngaire and I were separated and divorced after only five years of marriage. We lost everything. She was living alone with Jordan, and I was just alone. People would ask us individually, if there was any hope of us getting back together. The answer was always an emphatic “no”. After four years apart, there was a roadblock in the way, which may as well have had a sign that read, “No Future Without Forgiveness” (to quote Desmond Tutu). One night after long, lonely separate journeys, Forgiveness arrested us. There were many tears over the course of that night and, though neither of us was looking for it, hope was reborn in our hearts. I struggle when I hear of people who make decisions not to forgive. Perhaps they think that forgiveness is another word for excusing someone’s actions; it isn’t. It is simply saying that, “I will no longer hold this against you. For in exercising this power over you, I am also accepting all the corruption and bitterness that will flow from it to distort my own life.” I don’t think I have ever met a person who has held on to not forgiving, and been happy. Ngaire and I remarried in March 1991. It was one of the greatest celebrations ever. I still have people say to me that it was the most joyful and memorable wedding that they have ever been to. It was all about hope. Now, when these anniversaries (yes, we celebrated both), birthdays and festivals come and go, the rawness of Ngaire not being here for them makes a stark contrast with the hope that was the “fragrance” of our marriage. As I said, with her gone, there is only the past now. But there is love in abundance in my boys, dear friends and family; and from that, as I felt so strongly from Eddy‘s note, hope will be reborn. Ngaire’s battle with lung disease stretched out over a period of more than twenty years – over one third of her life; and I had the privilege of walking with her through it all. For the first seven there was hope that it may resolve itself, but thirteen years ago, the diagnosis turned sinister – to pulmonary fibrosis – which is always terminal. Over those years, my role was to love, support, care for, encourage and enable her to walk the path towards wholeness. We looked for healing, from the supernatural to the intensely natural: prayer, whole foods, herbal remedies, naturopathy and everything in-between. Because the prognosis was terminal – usually, at best three to four years – perhaps, in retrospect, there was a measure of healing in some of those. After one visit to Bethel Church in California in 2005, where Ngaire was prayed for, she was completely symptom-free for eighteen months. Two subsequent visits, however, yielded no such fruit physically. All of that is to help paint the picture that this was a long journey, full in many varied and challenging ways. One of the things that we learnt early on in the process was that the medical profession wasn’t very good at giving you bad news. In many ways, they were often quite brutal and many times we found ourselves clawing our way out of a pit of despair (I should say, however, that Ngaire’s doctor for the last three years was an exception to this experience; we found him hopeful and supportive, even when things went sour). I found myself needing to be Mr Positive because of this, always pointing the way to the positive aspects, always trying to provide her with an anchor point for hope. The reason for this is the real help that hope provides, emotionally, psychologically and physically. The alternative – despair – soon carves a slippery slope to destruction in the often desperate heart of one with a terminal sentence. Even in her last thirty-six hours, Ngaire hoped and believed that after her sedation and intubation, she would wake with new lungs from a transplant. I am relieved that that was in her heart rather than hopelessness and despair. Of course, my own personal journey was different. I purposed to maintain her hope, but would, myself, at times, visit dark places, writing of hopelessness and the feeling that my days were a rehearsal for what life would be like without her. This would happen particularly when she was convalescing elsewhere or on one of her several hospital visits. Without her presence in the house, the whispers would often be that my actions of preparing meals, doing washing and ironing, making lunches, organising cleaning rosters amongst the boys, were all practice for the future when she would no longer be with us. I couldn’t talk to her about this, which is more difficult than I can tell. In almost everything, Ngaire and I would seek each other’s opinions, thoughts and feelings. I think the word that I used in an earlier blog was symbiotic. Since we remarried in 1991(for those of you who don’t know, we were separated and divorced for five years – that’s another blog), our marriage was totally different. We had almost a singularity in our approaches to things. We would use ineffectual words like “team” and “agreement” but it was much more. I cannot tell how many hundreds of times I would pick up the phone to call her and she would be calling me, and vice versa; we would often be jointly thinking of the same things or people and begin to speak about them together at the same time. Much of this kind of thing is not uncommon in close marriages, but we had fought some hard-won battles to bring us to where we were. Part of our remarriage vows said, “I give my life to you as an open book”. Now, here I was with all of these feelings of hopelessness and despair, and I was unable to tell her, because I knew that it would be destructive in her physical battle. One of us needed to be paddling the boat, and that was usually me. I have learnt that this is often what happens to a carer. I saw it in my own father as he took care of my mother through many years of Alzheimer’s. Despite my urging he found it difficult to open up about his struggles – which were deeply evident in his demeanour – and mostly kept it bottled-up, to his and our great detriment; he died shortly after mum. However, I am immeasurably grateful for those few friends in whom I could entrust the deep, dark things, who supported, prayed and help strengthen me for the road. So where does faith sit in all of this? 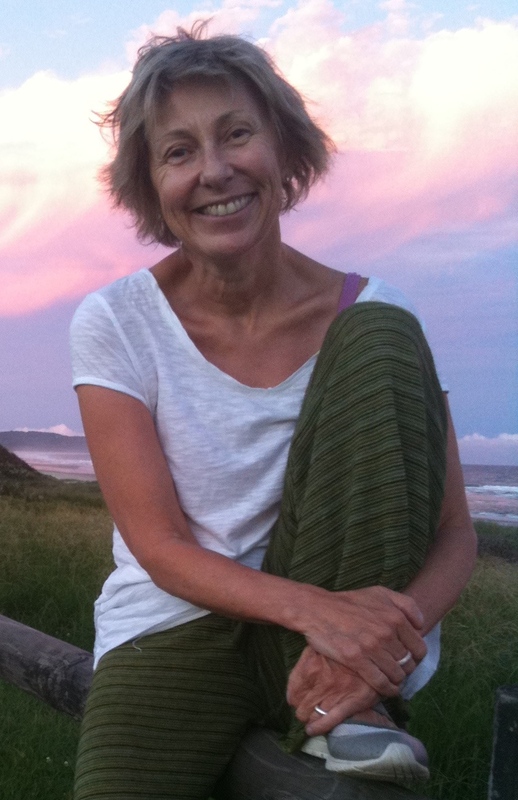 Over the course of Ngaire’s illness, faith changed shape enormously. In fact, to enlarge the metaphor, it became an almost unrecognisable monster at times, as we waded through the mud of “unlearning” what faith is. As an aside, I am bemused by atheists, some of whom are my friends, who in their own “evangelism” presume that I, or others who think similarly, have not grappled substantially with these issues of the existence of God. It is arrogance to presume this and flawed thinking to not allow another possibility. What is the difference between that and a rabidly fundamentalist Christian? I digress. It is not about me having an expected outcome. It does not dictate that I must badger God until he gives me what I want. It is not about having an expectation that everything will be peachy. God is far bigger than any box that I may create for him or indeed, any understanding to which I may come. God can do things any way he likes. Suffering is an integral part of the journey to joy. It is O.K. to doubt. Faith is purified more by unanswered prayers than answered ones. I was talking earlier about Ngaire’s and my closeness. I don’t want to give the impression that it was all sweetness and light. To reach the gold you have to dig the dirt; at times we could be downright abrasive with each other: I have some memorable journal entries! But, generally….mostly…..entirely…we were deeply in love. I wrote this about eighteen months ago, after we returned from California; Ngaire had taken a downturn and was staying at our friend, Moira’s, place.